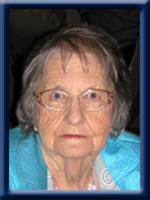 CONRAD – Pheobe Mae, 84, of West Berlin, Queens County, passed away on Thursday, February 6, 2014 at Queen’s Manor, Liverpool. Born in Eagle Head, Queens County on September 16, 1929, she was a daughter of the late John and Laura (Munroe) Conrad. Pheobe’s family came first and foremost and she devoted her life to her son Gordon. In her early years, she worked cleaning houses and looking after children and later worked at the Mersey Seafood Fish Plant in Liverpool, Queens County. She enjoyed playing cards, going out for supper with friends and family, traveling, loved animals and she loved spending time with her granddaughter, great-grandchildren and her many nieces and nephews. She is survived by her son Gordon, granddaughter Roxanne (Rick) Costain, great-grandchildren Hailey, Maya, Cole, nieces Richelle, Julie (Byron), Lori (Dave), nephews Tim (Susan), Glenn (Kathi), step-nieces and nephews and her many great nieces and nephews. She was predeceased by her brother Leonard and sister Sadie (Conrad) Parlee. to lori, Julie and all the family, my heartfelt sympathy goes out to all , she will be missed by many. Gordon and family – I am sorry to hear of your Mom’s passing. Please know that you are in my thoughts and prayers. Gordan and family,im so sorry to hear of Pheobes passing,I will miss out chats at the manor,she was a wonderful women,a big heart,i will miss her very much. Gordon, Roxanne and family thinking of you as you remember Phoebe. Hugs. I wish to extend my sincere condolences as you go through this loss of your loved one. Gordon and Family: We are very saddened to hear of Pheobe’s passing. We will always remember her friendly ways and great smiles. Our thoughts and prayers will be with your family during this very sad time. Sorry to hear about Phoebe. It is always difficult to lose someone who is close to us. It is a reminder that life is precious and the need for us to live every day to the fullest. Sending sincere condolences to you at this sad time. Gorden & family,, Sorry to hear of Pheobes passing I have heard her name quite often when Evelyn was living she spoke of her often and what a nice lady she was. please accept our condolences. Our thoughts and prayers are with you . My sincere condolences to Pheobe’s family. Gordon and family, We were sorry to hear of your Mom’s passing. Thinking of you and your family at this difficult time.